the 5 things that is important to my success in math 10. 1st. don’t try on the end of the chapter because its more stressful if you see that your failing you just start trying just because you want to pass the course. always try from the beginning so its more easier for you to pass math 10. 2nd. Follow the instruction a so you know what to do and always do your homework so you know what to do and homework is kinda practicing what you just learned. 3rd. always hand in something on time so you don t have to do it at the same time. for example blog post every week always do it every week so you don t have to do it at the really early test and harder test. 4th. never skip the class or missed as possible because every chapter is important. Because if you miss at least 1 lesson its going to be hard to catch up if your not a fast learner. 5th. lasts is be friendly in class and be able to communicate to the other people because if you need help they can help you because you been friendly and you communicate to others. this week I learned about solving system of linear equation by elimination. The graph of f is the graph of the equation y = f(x). Use function notation, evaluate functions for inputs in their domains, and interpret statements that use function notation in terms of a context. Recognize that sequences are functions, sometimes defined recursively, whose domain is a subset of the integers. he distance formula is derived from the Pythagorean theorem. 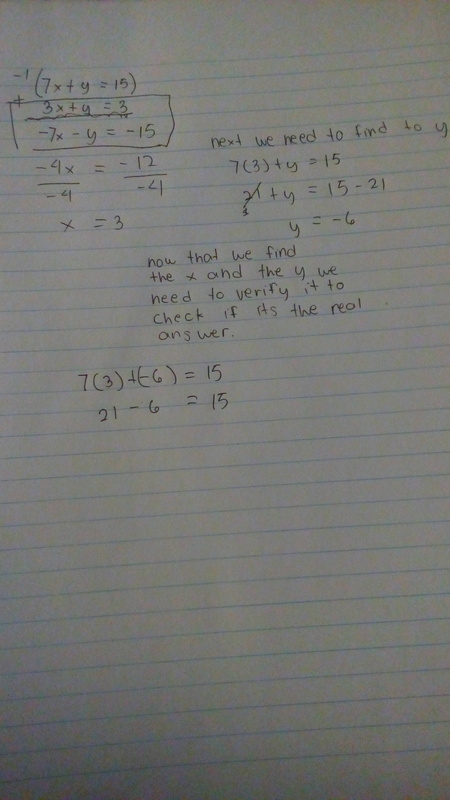 To find the distance between two points (x1,y1) and (x2,y2), all that you need to do is use the coordinates of these ordered pairs and apply the formula that is given to you. 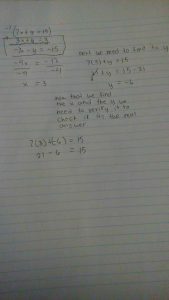 this week i learned about equation and what are some step to solve the equation. 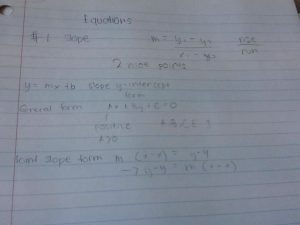 I learned 3 different ways to solve the equation. 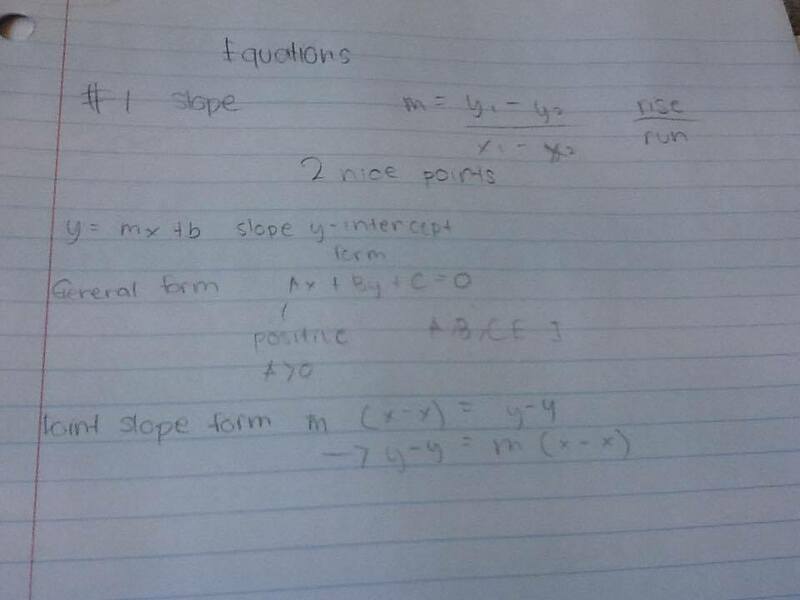 first the slope y-intercept form y=mx+b. second the General form Ax+By+C=0 It always has to be positive in front and it always has to equal zero. Third is the point slope form m(x-x)=y-y or y-y =m(x-x). This week i learned about the slope,parallel and perpendicular lines, equations of lines, desmos. A line is said to be perpendicular to another line if the two lines intersect at a right angle. Slope is often denoted by the letter m; there is no clear answer to the question why the letter m is used for slope. for example the rise is 12 and the run is 18 so the slope is gonna be 12/18. This week we introduced the patterns and grapping. – Discrete variable is a variable that are counted like people, car and any other that can count. – Continuous variables is a variable that are measure like time and distance. Every part of the squared have a name the upside right is called Quadrant #1 (+ +) the upside left is called the quadrant #2 (- +). The bottom left side is called the Quadrant #3 (- -) and the last one is the Quadrant #4 (+ -). There is a five ways to find out which is independent and the dependent the Table of value, Mapping Diagram, Equation, Graph, and Ordered of pair.